Canadair CL215 v3.0X Multirole amphibious aircraft. Tested with FSX SP1 but works also with SP2 and Acceleration. This is an update of the model and textures released in October 2008. The Canadair Cl-215 made its maiden flight on 23 October 1967. The first delivery was to the French civil protection agency in June 1969. Production of CL-215s continued through to 1990 with 125 built. This amphibious aircraft serves a number of roles in a number of countries, ranging from forest fire fighting to oil spill control on the open sea. Nicknamed the "Waterbomber" or "Super Scooper". Package includes aircraft model with 2D panel and 3D VC by Massimo Taccoli. Eight variation of textures by massimo Taccoli with help by Michel Gerard. FD files by Dennis Seeley. Gauges, by Dennis Seeley and Massimo Taccoli. Sound files with permission by Dave Eckert. Visual Models V.3.01, 3.02, 3.03 by Massimo Taccoli. Textures By Massimo Taccoli and Michel Gerard. Gauges by Dennis Seeley and Massimo Taccoli. P&W R2800 Double Wasp engines Sound files used with permission of Dave Eckert. The Canadair Cl-215 made its maiden flight on 23 October 1967. The first delivery was to the French civil protection agency in June 1969. Production of CL-215s continued through to 1990 with 125 built. This amphibious aircraft serves a number of roles in a number of countries, ranging from forest fire fighting to oil spill control on the open sea. Nicknamed the "Waterbomber" or "Super Scooper," the aircraft can skim lakes, open water or reservoirs to fill its tanks with water. The water is mixed with additives and then dropped on wildfires and occasionally structure fires. The aircraft has a 2,673 l (1,410 US gal) fluid capacity, and is able to fill its tanks from a source as shallow as two metres in a mere 12 seconds. This model made with the program fsds 3:51 is an following update to that published in 2008 and was compiled with makemdl for FSX. Tested with FSX sp1 but works seamlessly with the new SP2 version with accelerator but only with the graphics libraries DirectX9. This new version of the 3D model has been updated in several details in the light of extra information gave to me by Michel Gerard who oversaw the revision of the textures with new details. The model was revised by making several changes to the external part of it. Were added and / or corrected several details the result of a careful examination of the photographic material found by Michel. 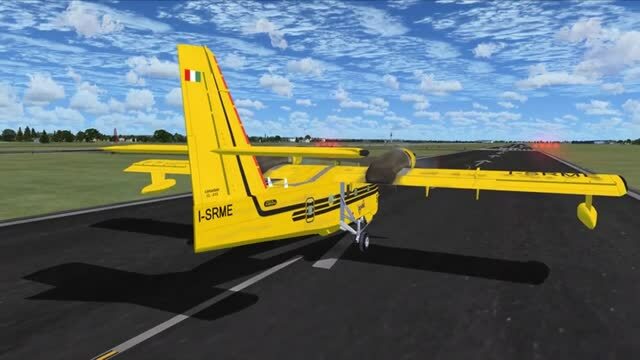 The cabin has a virtual VC with levers, handwheels and pedals animated, with doors opening, access ladder, engine cooling flabels are animated, and also the propeller blades with the possibility of blades pitch change. The cabin also has virtual instruments illuminated at night, landing and taxi lights emitting of light beam. The study of the many photos of the various operators of the aircraft revealed some differences between various models used, which led to the decision to build three different versions of the model, differences are not substantial but are surely characteristic. Particularly in three versions that I distinguished with the numbers 301, 302, 303, will show the location of the landing lights on the wing leading edge or recessed in position beneath the wings, the presence or absence of observation bubble windows immediately behind the trailing edge wing and the presence or absence of the radar antenna bulb to nose of the plane. 1) Model of the French Civil Protection F-ZBBV in two variants, with the early and late markings. 2) Model used in Greece. 3) Model used in Canada by two different operators, one of the CONIFAIR organization for the Quebec province the other of Newfoundland province. 4) Model used by CEGISA company a civil operator in Spain. 5) Model used in the past in Italy by the Sorem company . As soon as I have time I'll release a paintkit update for those who want to repaint the model. The flight characteristics and performance were made taking into account the official aircraft data. 2D panel and the 3D is a fairly realistic interpretation of the effective layout even if the design does not always correspond to that of the instruments installed on real aircraft panel. The gauges were made by Dennis Seeley and myself and are in XML format. If present remove the former CL215 model version . Extract the here provided zip file in a temporary folder copy the folder Canadair CL215 into the Airplane folder of FSX. Then copy the contents of effects folder (three files) inside of FSX effects folder. Each folder contains a texture image of the model that will be shown as a variation of Canadair CL215 model in the aircraft selection menu. Then launch FSX and you'll find eight Canadair Cl215 models in the Free flight menu under Bombardier/Canadair as aircraft manufacturer. Who want to exchange the installed water effect with the retardant effect (red) , just make copy and paste of the following lines of text in the corresponding section of aircraft.cfg. Note: aircraft.cfg file can be edited with a simple text editor , windows notepad is the right program to use. That's all and have a good time! Double check everything before e-mailing me! the most of problems I am asked to solve are due to not having read readme files!! Wish to thank Michel Gerard for his help with the textures in the creation of this new version of the model. (*) I also want to thank Kittisak Rukkaew for his repaint of the CL215 with the colors of the Royal Thai Navy to which I inspired myself to make the corresponding set of texture present in this new version of the model. Dump water operation and advices. In the aircraft.cfg file have been added appropriate-sized auxiliary (drop) fuel tanks to represent the fire retardant payload. Because of this IT IS VERY IMPORTANT to remember to adjust the total fuel load to keep it below the MTOW for land or water takeoffs. These are given in the Performance section of the ircraft.cfg file. Not correcting those values would be difficult to take off from the runway with the overveight and impossible to take off or even move when floating in the water. Using of drop tanks to simulate the water tank weight give realistic feeling of weight decrease when the water/fire retardant is dropped. It seems that there is not a valid solution to restore the weight of water/fire retardant in the tanks, or we have not found one. The only valid solution is to select a different aircraft and the select again the CL215. However It is possible to simulate water tank refill and drop using the water dump panel and perform water dumping operation with water dropping effect, but you cannot feel the effect of weight decrease when the water/fire retardant is dropped if you don't use the right weight in the auxiliary water tanks. This is only possible when you load initially aircraft and adjust the auxiliary fuel tanks with the appropriate quantity that should be maintained below the MTOW, Max Take OFF Weight. Canadair CL215 landing on water. The archive 215fsx_v3up.zip has 430 files and directories contained within it. I first had the pleasure of using the Version 3.0 of the Canadair CL215 when it was first released in 2008, and since then I’ve been able to upgrade to the updated 3.0X. I have to say that ever since I first heard of this back in 2002, I always intended to try it. Life got in the way though and it always missed out, but when it finally got installed I really regretted not doing it sooner! This is, without a doubt, one of the most detailed projects that I have ever used within a flight simulator. It’s massive attention to detail on getting everything from the sounds of the P&W R2800 Double Wasp engine to sound exactly as it should to the extremely vibrant red and yellow colors of the aircraft is one of the most impressive things I’ve come across in terms of aviation mods. It really does do the real thing perfect justice, providing us with a chance to go back in time and use one of the most beloved aircraft of the 1960s and beyond. It was still produced until the 1990s and for many people it’s a highly recognizable aircraft, and now you can finally take off with it! Otherwise known as the Super Scooper, you’ll be able to get a totally 2D and 3D recreation of this beast. The cockpit model and panels have all been generated to the highest possible levels of detail, making sure that it really has all of the additions that you could possibly need. Massimo Taccoli, David Eckert, Dennis Seeley and Michel Gerard must be given massive credit for their ability to capture the look and feel of an aircraft in such an accurate manner – it really is massively impressive to hop into the cockpit of this. Crated using hours of study and research about the aircraft, this carries a mark of authority about it – it’s about as close to the official thing as you are likely to find for a flight simulator. The stunning detail and quality of the textures belies the software that it’s running on, and makes it incredibly easy for people to hop into the cockpit and enjoy the delights of such a detailed and intricate piece of hardware. The latest update totally revamped the model further again, though, and the changes introduced were just immaculate. From the tiny features that were missing before to the level and quality of the animations were put in place, you will find this incredibly easy to get used with without too much trouble – it just takes a bit of time to get used to the color! In this package you also get three variations of the area – 301/302/303 – and each version has some very subtle differences to one another. This gives you even more variety from things like recessed wing edges to the addition/removal of observation windows makes sure that you have plenty to play with. From the quality of textures to the intricate nature of the features, this is about as close to the real thing as we are likely to get today! Well worth a download if you are into old-school aircraft, in my opinion. This bird is a blast to fly! Really cool water effects and great graphics too...thanks Ian! !